. . . but the problem posed by America’s half-million homeless is ripe for engineering solutions. When the management of an apartment building in London implanted spikes in the pavement to fend off would-be loiterers in 2014, a public petition with 130,000 signatures prompted the city to order the spikes removed. No such public outcry is heard in the U.S. capital, where bus benches are short and curved with notches to deter sleepers, made of metal that gets extra cold in the winter and keeps people from sitting too long. At home and overseas, American engineers regularly apply their problem-solving skills to improving the human condition. But when it comes to one of the most pressing social problems in the nation’s cities—our homeless population—the most visible examples of engineering are often ones that deprive them of comfortable places to rest and sleep. These range from “no-sit benches” that you can only lean against to strategically placed rocks embedded in flat surfaces and fences put up to block homeless encampments. Daily impediments reinforce what some homeless people see as a callous attitude on the part of authorities. “They think everyone has forgotten about us, no one cares about us, so they think they can do whatever they want to us,” says Rachel Higdon, 26. A former writer and vendor for Street Sense, a Washington, D.C., newspaper written and distributed by the city’s homeless, Higdon lived on the streets for over two years, during which time she was often forced from her sleeping spots by law enforcement officers. In 2016, the U.S. Department of Housing and Urban Development counted 549,928 people experiencing homelessness in the United States. Around 68 percent of them had some form of shelter, in the form of “emergency shelters, transitional housing programs, or safe havens,” but the remaining 32 percent were “unsheltered.” Advocates for the homeless believe that the numbers are higher than reported because the population is so difficult to count. Listening would expose a range of problems that often seem insurmountable to people experiencing homelessness. Warmth is only one piece of the puzzle. Existing shelters are often rife with theft, bedbugs, unhygienic conditions, violence, and sexual assault. Many people would rather be on the street than in a shelter. “A lot of people don’t want to go into them because they feel freer outside,” says Higdon. “It actually feels safer outside sometimes.” In his five years on the street (and 14 years on D.C.’s waiting list for subsidized housing), Martin says, he spent only two nights in shelters. Shelter or no, the homeless are almost always sleep deprived and dehydrated, he says. “Carrying stuff is a problem,” says Martin. “I have a bad back.” Train and bus stations did away with long-term storage lockers out of security concerns. Martin and Higdon both reported hiding their belongings out of sight in black plastic trash bags, but said that people would sometimes find them and throw them away. At the same time, “you can’t drag all that stuff to a job interview. They’re not going to hire you. Heck, they’re not going to let you in!” says Martin. He and Higdon would both like to see engineers come up with homeland-security-compliant public lockers where they could store their stuff for 24 to 72 hours, possibly centralized at the places where they receive their services. Access to clean bathrooms—or any bathroom access at all—poses a significant hurdle. Public restrooms are becoming rare. Shop owners don’t want to let the homeless use their restrooms to clean up, Martin says, “but then they complain that we smell bad.” For many people, it’s a choice between going to the bathroom or going to jail for public urination. Because of that, many will simply forgo drinking water so that they don’t have to go. This leads to extreme dehydration and kidney conditions, Martin says. One solution to this is the “Portland Loo,” a low-cost public city toilet that locks for privacy, is easily cleaned, and has outdoor faucets that anyone can use even when the toilet is occupied. Portland, Ore., adopted the design and has a loo stationed every eight blocks. This benefits tourists as well. Higdon says that hygiene was one of her greatest difficulties. “I was one of the few who used SOME’s,” says Higdon. So Others Might Eat (SOME) is a Washington, D.C., homeless service center that opens daily for bathing. The catch is that it’s open for only 45 minutes each morning for women. “You only had three showers and 25 women trying to take a shower. Not everyone would get to shower. A lot of people were embarrassed to go or couldn’t get there when they were open.” A San Francisco organization, Lava Mae, had a different approach: retrofitting old buses into public showers that can traverse the city in search of the people who most need them. Before she left school, her Lotus Cups menstrual cup design took second place and a $10,000 prize at the Min Family Engineering Social Entrepreneurship Challenge. Her company sales pitch reads, “You’re on the second day of your period with no access to a tampon or a way to clean up. How are you going to go to a job interview?” This encapsulates the cleanliness conundrum that many homeless women face. It’s still in the prototype phase. “There has been pushback from shelters because they don’t like to think about women emptying blood in the bathroom toilets or sinks.” Stearns and her team have instead been marketing more to low-income women with large families who can’t afford to buy menstrual products for, say, their five daughters every month. They are working with the OB-GYN department at the University of California, San Francisco’s medical school to make it better adaptable to women’s different shapes. They’re also working on FDA regulations and on finding more funding. Until then, they donate other menstrual cups to shelters and hold workshops on how to use them—because they can have a steep learning curve that turns some women off. “The phone is a lifeline,” says Silvia Figueira, associate professor of computer engineering at the University of Santa Clara and director of the Frugal Innovation Hub. “Some would pay for the phone before food. The phones actually enable them to get out of poverty. How do you get a job if you don’t have a phone? How do you find housing?” A higher percentage of homeless people own smartphones than the rest of the population, it turns out—in part thanks to Obama Phone, the Obama administration’s promise of free smartphones to the poor and homeless. But the device has not been fully exploited. Figueira got involved when she was approached by an organization called the Computer Technology Alliance (CTA) asking her help in making services for the homeless more accessible, once they figured out that most people on the streets had access to phones. The program is called Mobile for All. “We participated in that by developing applications that were uploaded to phones that were donated,” she says. Figueira also started a hackathon that she called Hack for Homeless to write code for the applications and think of other creative solutions that might help the homeless over a 24-hour period. It’s developed into a popular new initiative called Hack for Humanity, in which students tackle different humanitarian issues—the next one will center on disaster recovery. The event attracts up to 100 students each time. With that many dedicated coders working all at once, the students were able to come up with some remarkable applications that connect people on the streets with vital services. Housing First is a systems approach that offers shelter to the homeless without requiring that they be sober, medication-compliant, or employed. Those issues are addressed concurrently or even after people are housed. Andrew Hening employed the model with his HOT (Homeless Outreach Team) program in San Rafael 18 months ago. 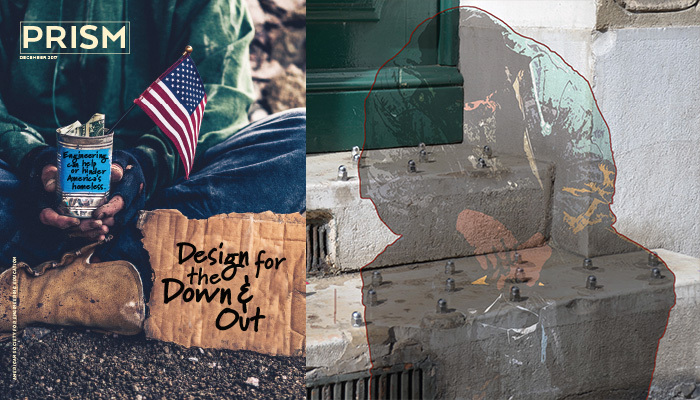 A recent M.B.A. graduate from the University of California—Berkeley, Hening says he became profoundly aware of homelessness through an interdisciplinary innovation course called “Reimagining Slums” that integrated engineering design and systems thinking. During the course, he mapped out the causes of chronic homelessness, such as ill health, debt, addiction, and jail time. HOT introduces displaced people one at a time to providers of medical and other services and employment counselors. “You’re coming up with a customized housing plan for how you’re going to support them. You address all their needs at once rather than make them find their own way through an impossibly complex system,” he says. Among HOT’s 20 occupants, there has been a sharp reduction in 911 contacts and a parallel drop in emergency medical transports. Aggies Without Limits (AWL), New Mexico State University’s humanitarian engineering club, is one of the few campus initiatives tackling a local homeless problem. Kenny Stevens, the club’s faculty adviser and professor of civil engineering technology, and Victor Meraz, a graduating senior in mechanical engineering technology, got involved when a local group, Community of Hope, approached them. Working with the group starting in 2011, they helped turn what had been a squatters’ camp into a tent city for the homeless. AWL students laid out the camp design and drainage system, and conducted a survey of the retention pond. The camp has a resident homeless mayor who oversees operations and a homeless police force that patrols the area. It’s built to be transitional and rotate people into permanent dwellings so others can take their spot. It has a bathroom facility and 50 tent pads (for families as well as singles and couples). “It has about a 90 percent housing success rate and has placed around 500 individuals and families into permanent housing,” says Stevens. Two years ago, AWL switched its focus to Foxhole Homes, an organization that caters to homeless veterans. On 150 acres near Holloway Air Force Base, Foxhole Homes is building permanent individual 215-square-foot Earthship homes made from local mud and soils and recycled tires and bottles. Shops and business opportunities are planned. Meraz and his cohort made the CAD drawings for the first homes. It hasn’t been easy. “We’ve done projects in five different countries, and it’s a lot easier to work in Nicaragua than it is to work in Alamogordo, New Mexico,” says Stevens. With both Community of Hope and Foxhole Homes, the students have run up against bureaucratic red tape and local “not in my backyard” attitudes that work against them. In response, two mechanical engineers at the University of California—Los Angeles started Students4Students (formerly called the Bruin Shelter), which offers long-term free housing to up to eight students at a time. Luke Shaw, a Ph.D. student, and Louis Tse, a recent graduate who is now an engineer at NASA’s Joint Propulsion Laboratory, modeled their effort on the Harvard Square Homeless Shelter in Cambridge, Mass., established over 30 years ago. “At UCLA, we would see students sleeping in places where they really shouldn’t be, like the lounges and lecture halls and other common spaces,” Shaw says. “You see a lot of students showering in the gym, even though they clearly weren’t there to work out.” The shelter is funded as a student organization and through donations, sponsors, and grants. Now in their second season, they hope to expand—a good thing, because they have a waiting list 100 students strong. Shaw and Tse prove that engineers can help through altruistic desire, not just design. Jennifer Pocock is associate editor of Prism.